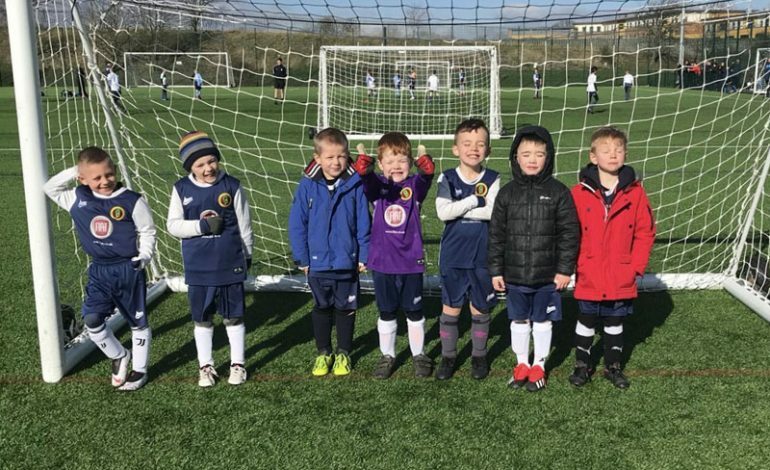 After the heavy rain washed out the majority of the fixtures last weekend it was back to action for the Aycliffe Juniors football teams this week. The Under 6’s played a series of mini games at Bishop St Mary’s Kings. They won one, drew one and lost two with Will scoring five goals during the games. The Under 7’s White lost out in their game against Easington by five goals to nil. The man of the match was Joel. The Under 7’s Juniors played a friendly away at Stockton Town Yellows. Despite goals from Jonah (2), Kai (2) and Marley this one ended in defeat. The Under 9’s played a friendly away at Hartlepool St Francis. They lost out by the odd goal in seven with man of the match Preston, Callum and George scoring the goals. The development game ended in a 2-0 loss with Jamie and Ethan sharing the man of the match award. The Under 10’s Whites played away at Shildon Reds, the hosts took an early lead and extended this to make it 3-0 at half time. In the second half Aycliffe came back in to the game but were denied by some great saves from the Shildon goal keeper. A counter attacking goal added to the home teams tally and they won the game 4-0. The Aycliffe man of the match was Joel. The Under 11’s White played in a keenly contested encounter with league runners up Hartlepool FC. Archie was the man of the match in a game that ended in a 1-0 defeat. The Under 12’s played their first 11 a side friendly against Hartlepool. Zak scored a hatrick in the first half and Jake added two after the break in a 5-1 win. This was a good performance and the friendly also allowed the opportunity for three new players to enjoy their first games for the Aycliffe team. The Under 13’s Russell Foster League team travelled to Swalwell Swifts and were unfortunate to lose an entertaining game 4-2. Lewis and Herbie scored the Aycliffe goals. The Under 13’s TJFA League team were reduced to only ten available players for their trip to play Grangetown. Despite being a man down they battled hard to get something from the game. Unsurprisingly they were stretched with a numerical disadvantage and conceded three goals. Lucas scored to get one back but the match ended in a 3-1 defeat. The Under 17’s looked to bounce back from last weeks narrow Challenge Cup semi final defeat when they hosted Northallerton Town at Woodham. The visitors strength was apparent as they opened up a 4-0 half time lead, showing why they sit second in the league. A change in formation and an improved performance after the break saw Aycliffe get two goals back through Noah but the game ended in a 5-2 defeat. Curtis was named as man of the match.